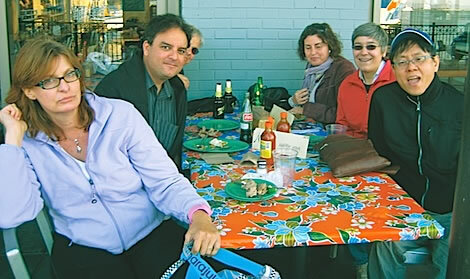 That’s what we did during one more Happy Hour gathering at Mijita’s Restaurant in the Ferry Building in San Francisco. This very casual restaurant has been the chosen spot for a number of meetings now. The Ferry Building itself offers a lot in terms of restaurants and interesting shops, not to mention the wonderful setting, both inside and outside, where the view is spectacular, with the Bay Bridge as background. The Ferry Building can be easily reached by Bart, Muni and the ferry from the East Bay; if you drive, parking might be a problem though. Our group that afternoon was small yet diverse: Raffaella Buschiazzo, (Italian translator and the event organizer), Katy Bridges (Japanese translator from Petaluma), Kaj Rekola (Finnish translator), Daniel Kim (Korean translator), Javier Moreno-Pollarolo (Spanish translator from Peru) and yours truly, Ana de Moraes (Portuguese translator). While enjoying the opportunity to sit outside, we talked about cinema, gave each other recommendations of must-see movies and Javier shared some insights into working with movie subtitles. We also talked about Chico State’s course on Web Localization which I am taking at the moment. I take this opportunity to thank Raffaella for organizing these events. They are indeed an excellent opportunity to network! I also would like to let members know that I am volunteering to organize Happy Hour events to cover the cities of Millbrae, Burlingame, San Mateo, San Carlos, Redwood City and Palo Alto. Nina posted this article under NCTA Events, NCTA Meetings, NCTA Members	on Thursday, September 1st, 2011 at 12:03 pm	You can follow any responses to this entry through the RSS 2.0 feed. Both comments and pings are currently closed.